Events from the year 1979 in Kuwait . 25 July - Khalaf Al Salamah. Haya Al Shuaibi is a Kuwaiti comedian actress. She began her career with the actress Taiba Al-Faraj in "Al Hermna" play in 1993, and continued after that in comedy roles on stage and on TV. Three of her cousins are actresses including Mai Al Balushi. Sheikh Nawaf Al-Ahmad Al-Jaber Al-Sabah is the Crown Prince of Kuwait and Deputy Commander of the Military of Kuwait. He is a half-brother of the Emir of Kuwait, Sabah Al-Ahmad Al-Jaber Al-Sabah. 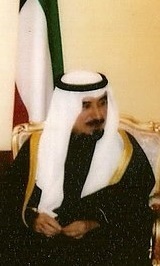 Nawaf was nominated as Crown Prince on 7 February 2006 against the tradition of the Al-Sabah family, according to which the offices of Emir and Crown Prince alternate between the Al-Jaber and Al-Salem branches. He is currently the oldest Crown Prince in the world. Events from the year 2014 in Kuwait. Events from the year 2012 in Kuwait. Events from the year 2006 in Kuwait. The following lists events that happened during 2000 in Kuwait. Events from the year 1999 in Kuwait. Events from the year 1997 in Kuwait. Events from the year 1996 in Kuwait. Events from the year 1995 in Kuwait. Events from the year 1994 in Kuwait. Events from the year 1993 in Kuwait. Events from the year 1992 in Kuwait. Events from the year 1978 in Kuwait. Events from the year 1977 in Kuwait.